1. Combine the cocoa, sugar and pinch of salt in a saucepan. 2. Blend in the boiling water, and bring the mixture to a slow boil while you stir. Be careful not to scorch. Burnt chocolate tastes just awful. 4. Stir in 1 3/4 cups of milk and heat until very hot, but do not boil! Milk gets funky if you let it boil. 5. Remove from heat and add the vanilla and half and half. 6. Allow to cool somewhat and pour into popsicle molds. Freeze until firm. Makes about 8 fudgsicles, or 6 pops and one cup of cocoa for the cook. I haven’t tried it, but I don’t know why not! 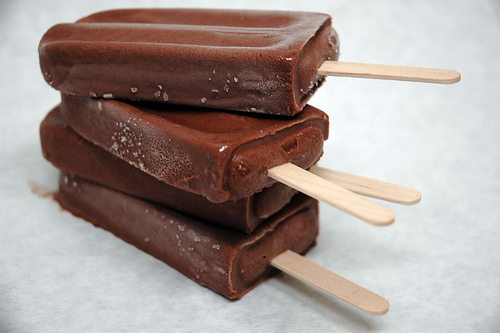 People have used coconut milk with success, and I did find a recipe with almond milk here: https://silk.com/recipes/creamy-fudge-pops. Love the name of your blog; I’ll check it out.